On the edge of the Khumbu Glacier and its surrounding moraine, is Everest Base Camp. Situated at an altitude of 5364m and over 1.5km long, this temporary settlement, which exists only from April until early June, is growing every year. 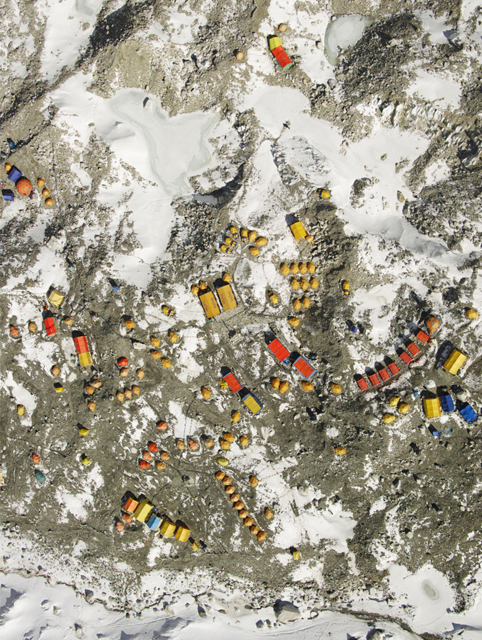 Following the deaths of 16 Sherpas on the Khumbu Icefall in 2014, which led to the closure of the site, Base Camp was again busy in 2015 when it housed over 1200 Sherpas, cooks, porters, professional guides and paying climbers. The Nepalese government had issued 358 permits for Everest, 114 for Lhotse and 56 for Nuptse - the neighbouring peaks. Over the last few years the number of climbing companies offering their services has also risen, with the biggest change being Nepalese firms joining the competition. This has meant the cost of climbing has fallen as low as $30,000 (US) with a Nepalese company and between $45,000 - $85,000 with a Western organisation. Discussions are underway as to how to control the numbers going forward. One suggestion is to ban those under 18 and over 75, those with disabilities, while only experienced climbers who have already scaled medium-sized Himalayan peaks will be issued with permits for Everest. 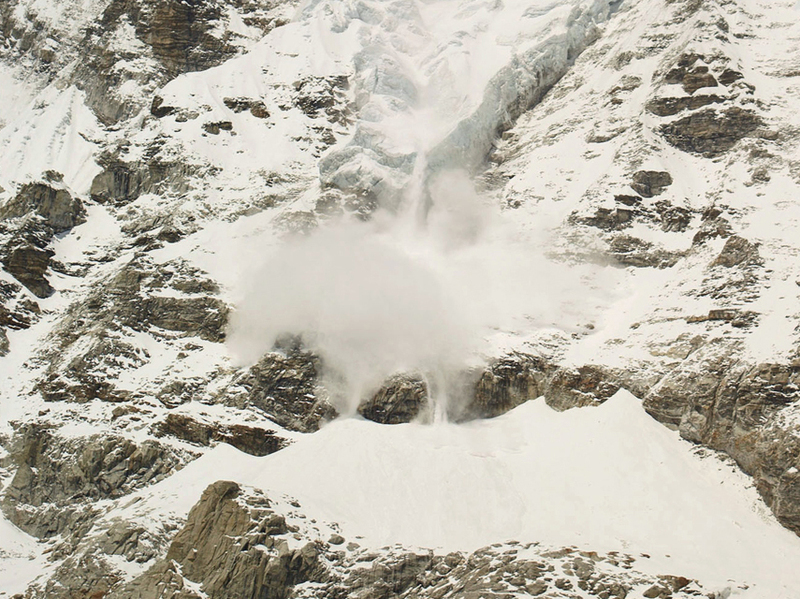 These images were shot just four days before the 25 April 2015 devastating earthquake, which then triggered the avalanche of ice seracs and ice cliffs on Mount Pumori and Mount Lingtren. The catastrophic events destroyed most of the encampments and caused the death of 19 people. One wonders whether the number of companies providing mountaineering assistance and individuals wanting to scale the peak, will start to change, as discussions about the environmental, economic, social and political impact continue. 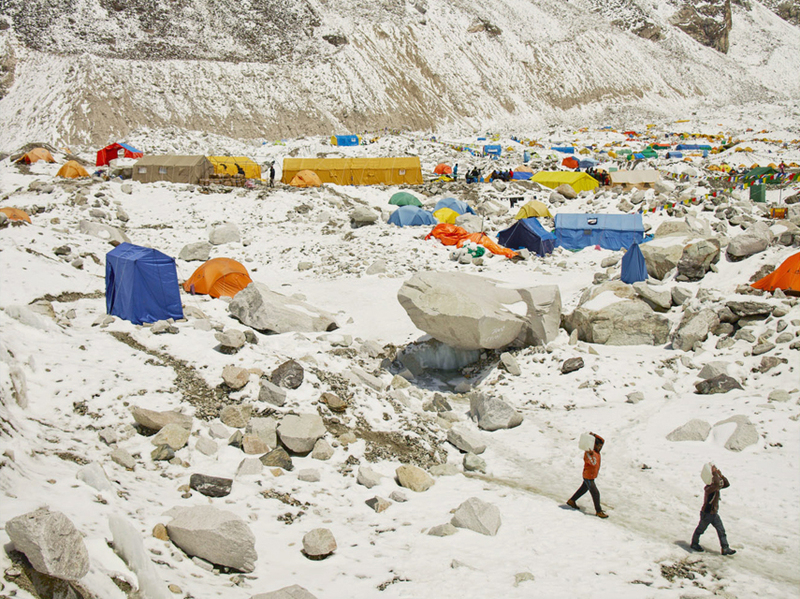 Climbing company encampments, upper base camp Everest, Nepal. 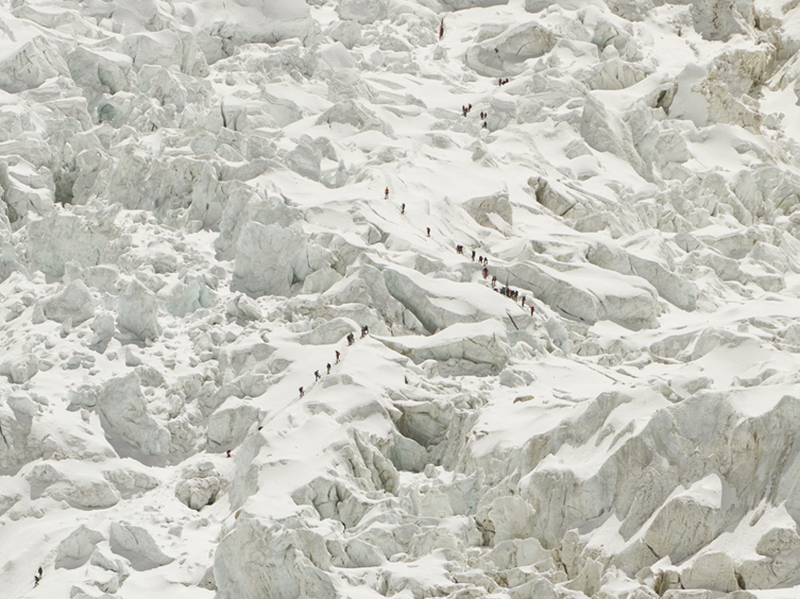 Sherpas guiding climbers up a new route on the Khumbu Icefall. 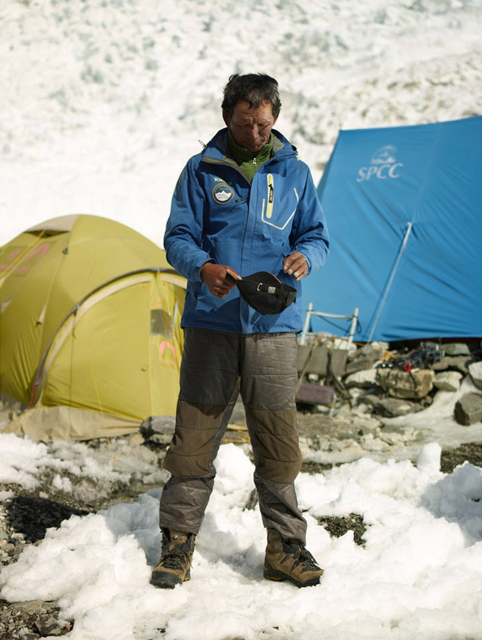 Ang Dorjee , president of the Icefall Doctors, elite Sherpas who open the routes up the mountain. 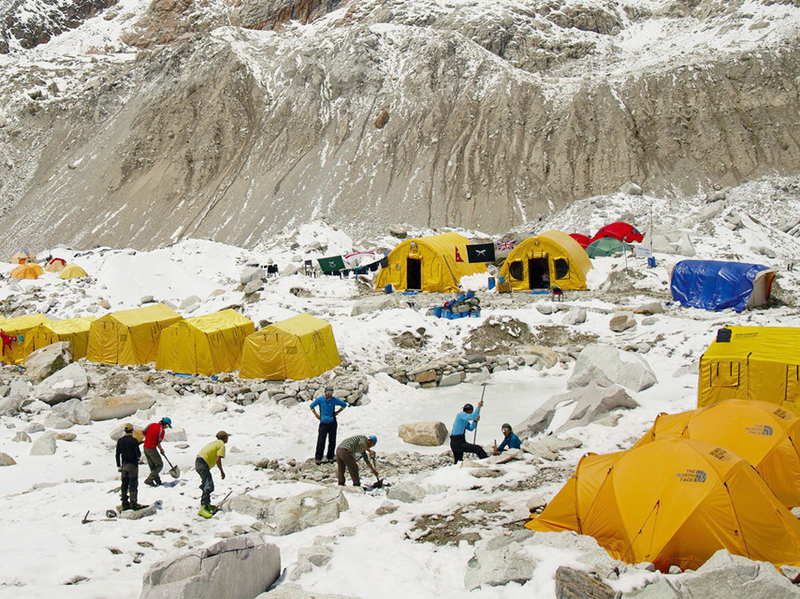 Sherpas prepare a climbing companies tent area. Encampments on the upper section of base camp. Resupplies and waste are all carried in and out by porters or yaks. 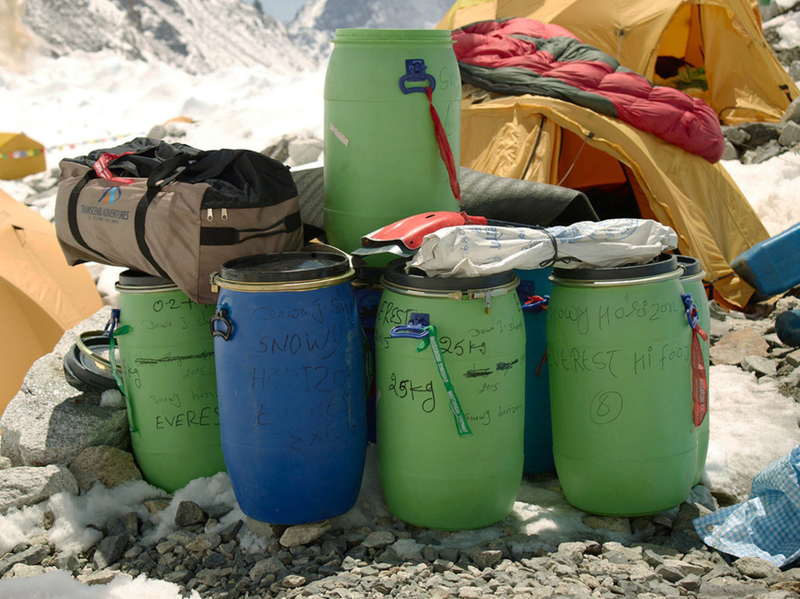 Porters carry loads of up to 70kgs, the price per kilo is determined by the altitude. 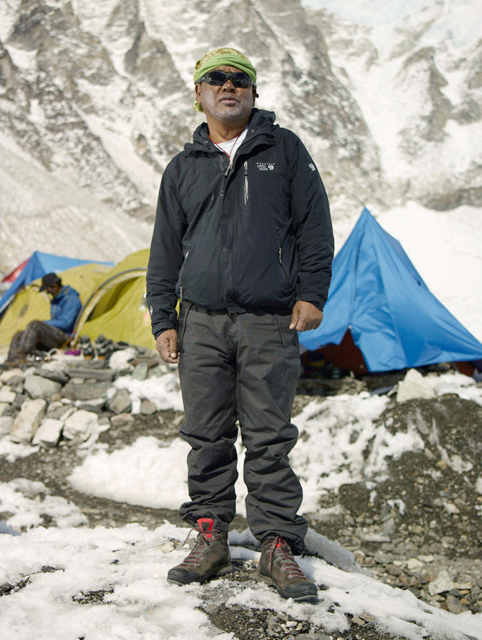 Nim Dorjee Sherpa, an Icefall Doctor. Encampments on a mid section of base camp. 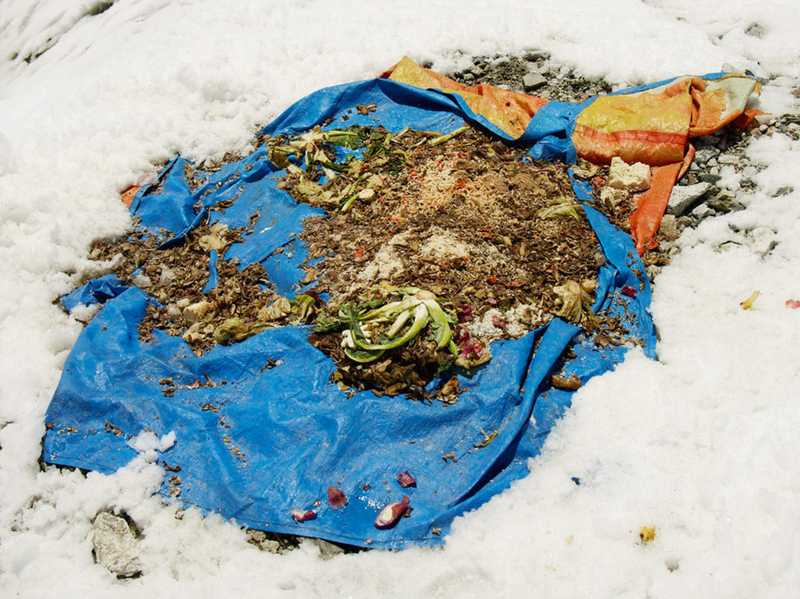 Food waste is dried in the sun before being carried out by yak. 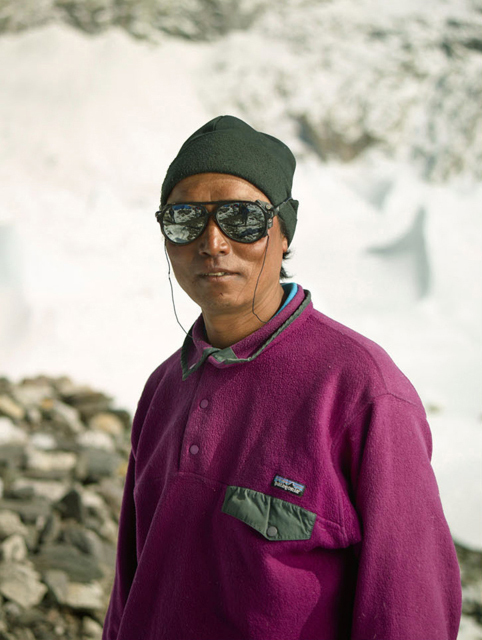 Ang Kami Sherpa, one of the oldest most respected Icefall Doctors. 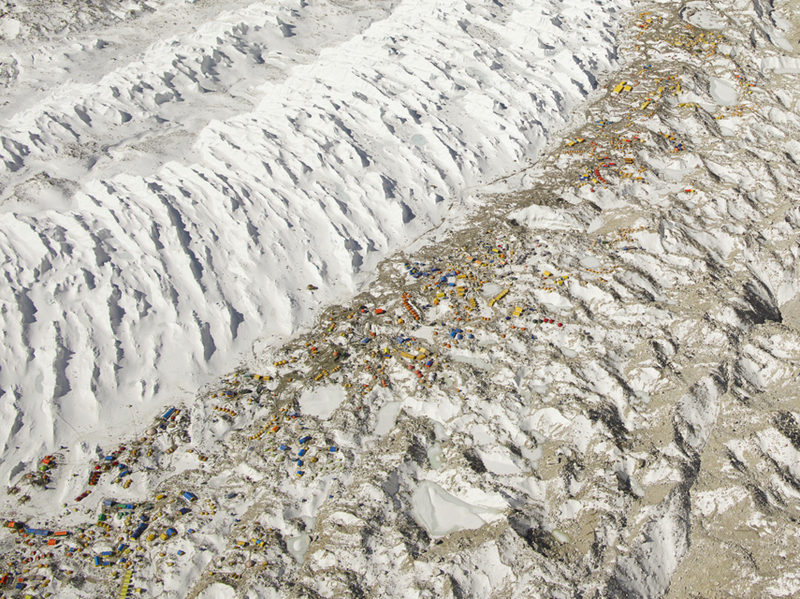 One of the many avalanches which occur daily around base camp. 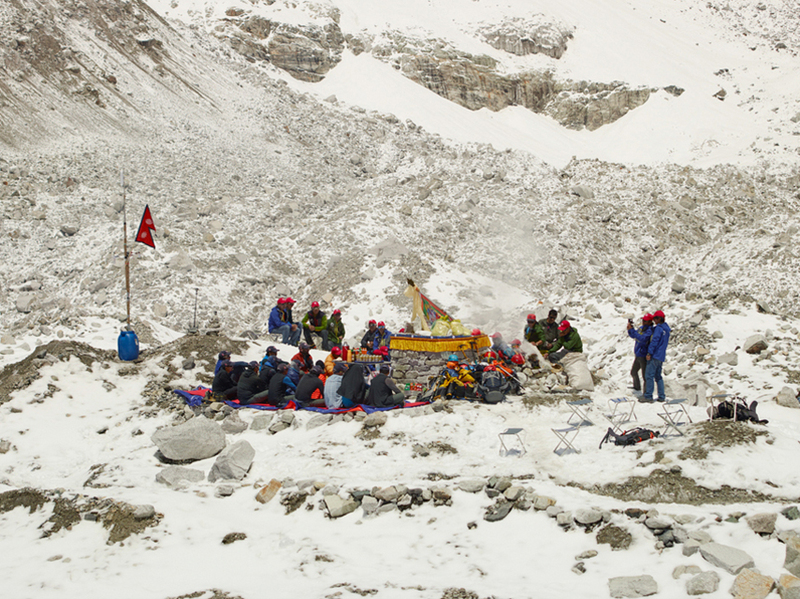 Sherpas and climbers perform a Puja ceremony which will invite blessings for the climb. On the edge of the Khumbu Glacier and its surrounding moraine, is Everest Base Camp. 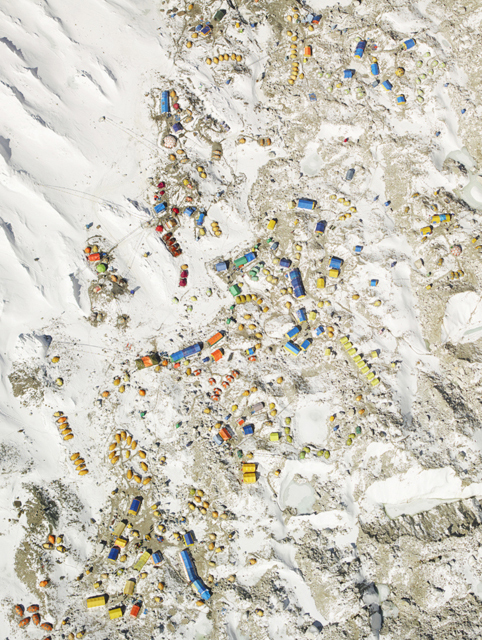 Situated at an altitude of 5364m and over 1.5km long, this temporary settlement, which exists only from April until early June, is growing every year. Over the last few years the number of climbing companies offering their services has risen, with the biggest change being Nepalese firms joining the competition. This has meant the cost of climbing has fallen as low as $30,000 (US) with a Nepalese company and between $45,000 – $85,000 with a Western organisation. Discussions are underway as to how to control the numbers going forward. One suggestion is to ban those under 18 and over 75, those with disabilities, while only experienced climbers who have already scaled medium-sized Himalayan peaks will be issued with permits for Everest. 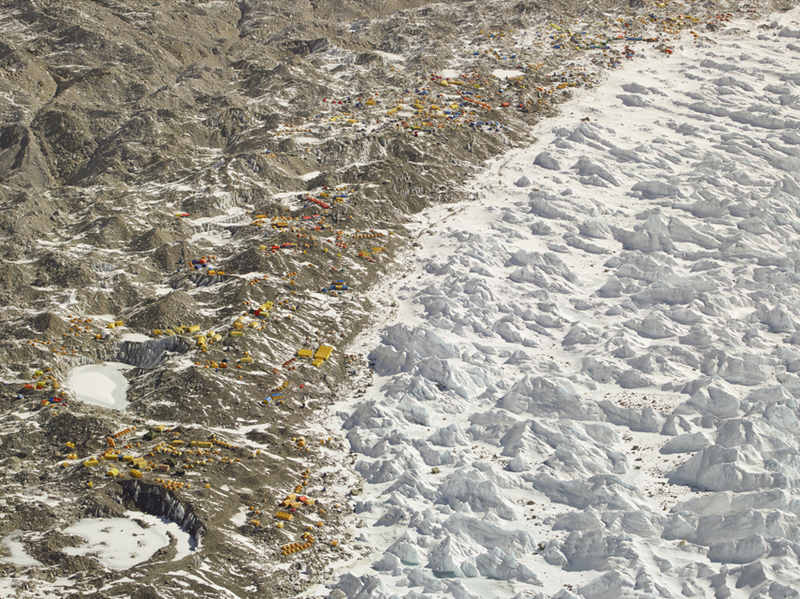 These images were shot just four days before the 25 April 2015 devastating earthquake, which then triggered the avalanche of ice seracs and ice cliffs on Mount Pumori and Mount Lingtren. The catastrophic events destroyed most of the encampments and caused the death of 19 people. At the end of the day its still the Sherpas who do the work and take the risk, one wonders whether the number of companies providing mountaineering assistance and individuals wanting to scale the peak, will start to change, as discussions about the environmental, economic, social and political impact continue.